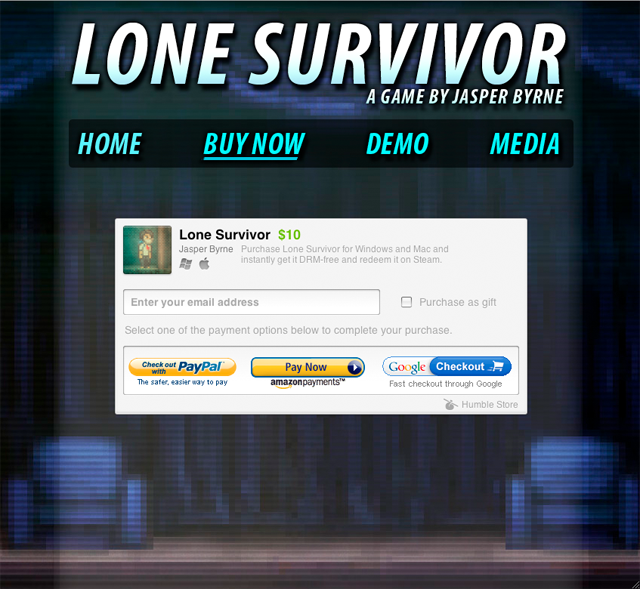 The title says it all, and you’ve probably heard it from the a million internet streams before this one – Lone Survivor is now a part of Humble Indie Bundle V! I’m incredibly proud to be a part of this incredible collection of games, and once again in awe of the guys over at Humble, Inc. I did have a good think about whether to accept the offer, for a couple of reasons… not least of which is that I’m feeling a bit burnt out – I really do need a proper break (after 7dfps, anyway…) But I realised in the end that I may never get another chance to reach people in a way like this, and I couldn’t pass that up. So the game will be given to everyone who bought HIB V before today as thanks for early adoption, regardless of what they paid – which means close to 400,000 people will already be guaranteed a copy! It will also be given to anyone who pays above the average from now until the end of the promotion, so if you’ve held off so far, why not head over to Humble and pick up your tasty bundle? So to Linux users, although the Projector version should work identically, you won’t be able to transfer saved games between versions, and you should watch for clearing your Flash cookies as it can delete your saved game in some instances. I wanted to use AIR for the Linux release, but AIR for Linux was abandoned by Adobe a while back. I do hope they’ll consider getting it back up and running, as there are a lot of successful indie games that are starting to use AIR, and it would be a shame to have to restrict those to Mac and PC only as new AIR features mean Linux becomes harder to back-port. Perhaps Adobe will take notice of the growing interest in AIR on Linux for game developers? I’d love to see a Linux Captive Runtime with AIR 3.3! Adobe’s support team have been great all through this, once I got their ear – testing builds of LS I’ve had trouble with, and inviting me onto the AIR beta program and so on… they’re really listening to what developers are saying, so if enough developers make noise about an AIR update for Linux, maybe it’ll reach them? It’ll go up as part of the Humble storefront on my own site, which initially will be the only place to purchase the Linux build, so if you are a new customer, you’ll now get three platforms for the price of one! It’ll also be available for purchase on Linux from this day forth over on Ubuntu Software Centre, who are handling the redemptions for the Humble Indie Bundle V.
Once again a massive thankyou to everyone who’s played the game, and shared their analysis, thoughts, personal feelings, images, music, videos, and general humanity via the update request emails. I’ve really loved reading them all! 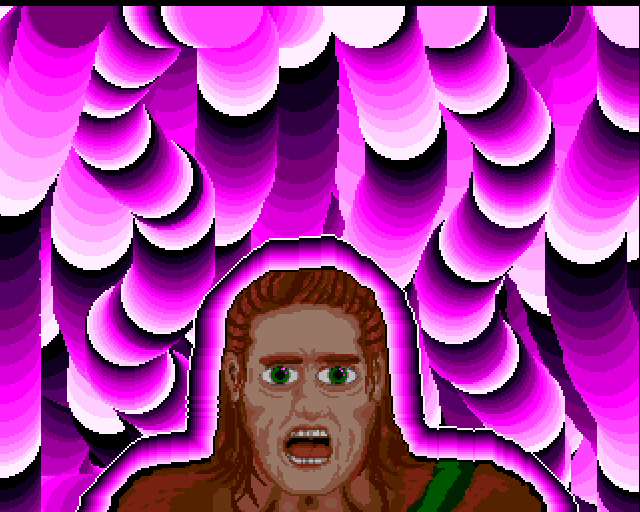 Things will hopefully start getting a bit calmer soon and I might even announce the new secret project I’ve been working on at some stage after 7dfps, which I’ve been (also) secretly getting ready for, making a special ‘virtual console’ and a basic 3D engine – screenshots to follow on Saturday. And to my 400,000 new friends: thank you for playing Lone Survivor, and don’t forget if you liked it and want to support Superflat Games in some way, why not head on over to Space Recordings on Bandcamp and give the OST a listen? Either way, I hope you enjoy your adventures with You. Be sure to write and tell me about them! This means you’ll get a free CODENAME: RED Steam Key on purchase from now on, or the DRM-version, it’s up to you! Everyone’s a winner! All existing customers are getting free keys for the Humble store, and from there they can make their choice. As I mentioned before, the Humble guys have gone out of their way to make a very smooth transition, and to take on the responsibility of my previous customers just to help me out, making sure everyone has the choice of update format. I can’t thank them enough for their help with this! Existing customers are most welcome to send their request at any time (see the previous blog entry for instructions.) I think most of the Mac users have got their updates now. We’ve still only done about 15%-20% of the purchases, so I’m trying to find a more automated way of doing it. But apart from the odd day off, we’ll be getting back to anyone who send a request in within a day, and it’s no trouble at all for the most part… In fact, it’s great fun reading all your kind, insightful, funny and sometimes even slightly strange messages. Thanks to everyone who’s bought the game on my site or Steam, and especially to the First Aid customers, who’ve given me a few months freeware-experimentation-room!